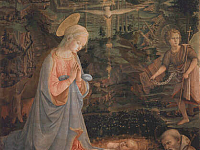 Orphaned at a young age, Lippi was raised by an aunt and later entered a life of the cloth with the Carmelite friars of Florence. 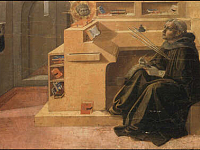 Though, as the biographer Giorgio Vasari (1511 – 1574) wrote, Lippi was distracted from his studies, often drawing on his books. He stayed with the friars for a number of years, but they permitted him to explore his artistry. This is reflected in his depictions of religious subjects where as an artist he was obliged to the cloth, but drawn to its human side. 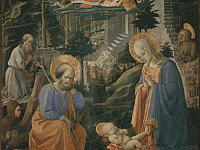 His earliest works as a painter are documented in Prato where he painted frescos of Saint John the Baptist and Saint Stephen for the main cathedral. 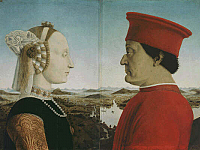 Cosimo de’ Medici (1389 – 1464) was an important patron for Lippi, just as Cosimo’s grandson, Lorenzo de’ Medici (1449 – 1492) would be to Lippi’s son, Filippino (1457 – 1504), also a well regarded artist. 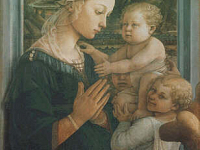 Lippi trained his son up until his death, and was also the teacher of Sandro Botticelli (1444 – 1510). 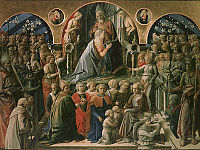 Lippi painted a number of frescos and altarpieces throughout Florence and later in life in the city of Spoleto near Umbria. He was well known for his depictions of the Madonna, including several of which are at the Uffizi Gallery; Madonna and Child with two Angels, Coronation of the Virgin, and Madonna and Child with Four Saints. Of his other pieces of the Madonna in museums throughout Europe are Madonna and Child Enthroned with Saints, Madonna and Child Enthroned, Madonna and Child with Saints, Madonna and Child, Madonna del Ceppo, Madonna in the Forest, and another piece titled Madonna and Child. 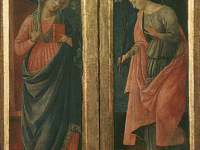 His last work done in the Spoleto Cathedral was a fresco series of scenes from the life of the Virgin, titled Storie della Vergine, which included the Annunciation, the funeral, the adoration of the child and the Coronation of the Virgin. 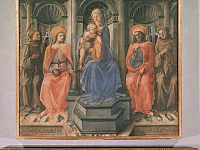 Left incomplete at his death, Lippi’s son Filippino completed the series and Lippi was buried in the Cathedral with a tomb commissioned by Lorenzo de’ Medici.